What is PJ Olsson’s Rock Camp? PJ Olsson’s Rock Camp is an intensive two-week music program that provides young musicians with real-world and life-changing experiences. Young musicians have an amazing opportunity to work closely with real life professional musicians, audio engineers, and technical crew. The Rock Camp kids, typically ages 12 – 19, learn and grow through talent discovery, musical development, creative collaboration, relentless rehearsals, production design, aggressive promotion and live performance. The Rock Camp concludes with an epic rock concert that thrills and delights an audience of over 1,000 fans. In an age of smart-phones, video games, and overabundance social media, kids are more likely to “text” than “talk” and “Facebook” than “face-to-face”. In a time of technology that creates spaces between kids, our community needs to provide more opportunities for kids to come together in safe, positive, and cultivating environments. 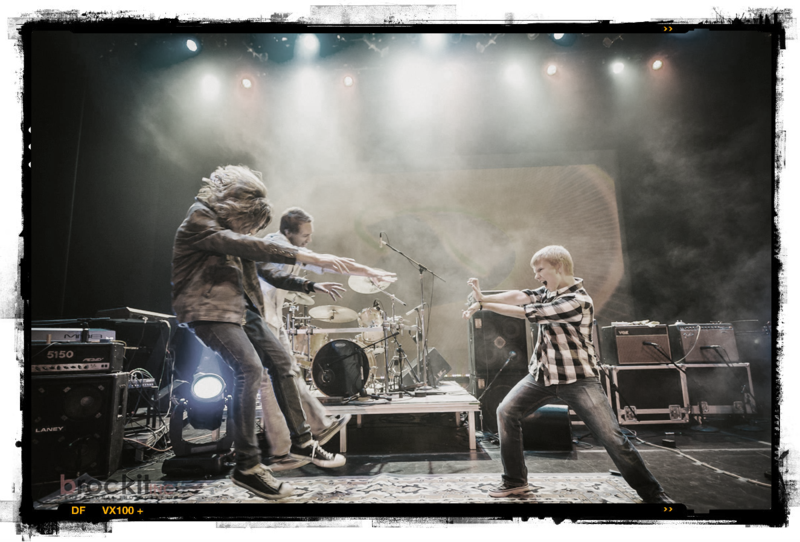 PJ Olsson’s Rock Camp is a pilot program, an experiment if you will, to see what happens when kids have the opportunity to live up to their potential, learn from professionals, collaborate with other talented kids and accomplish challenging goals. Rock Camp is an “intense” experience for young musicians. In just two short weeks, campers work through the entire process of producing a two-hour full-scale rock concert complete with big sound, hundreds of lights, video projection, complicated transitions and live performances. The schedule is aggressive and the demands put on the campers are no different from a professional working in the music industry. Rock Camp offers young musicians a real-life experience. Why is PJ’s Rock Camp innovative? Rock Camp is the exact opposite of a laid-back kids summer camp that ends with a cute recital. The entire objective of Rock Camp is ground-up production of a real rock concert that takes the audience on an epic music journey. Over two incredible short weeks, campers must organize into bands; define their style, sound, look and feel; select, learn, plan and rehearse their set; learn on-stage and front of house sound, work with lighting and video designers, and perfect their performances or risk having sub-par songs cut from the final show. PJ Olsson brings a lifetime of insight, experience and stories to young musicians at Rock Camp. A father of three children, PJ understands the challenges and pressures kids face these days and how music can help kid’s heads and hearts work together. PJ has demonstrated an uncanny talent for relating to kids, helping them open up and discovering their strengths and there weaknesses. PJ leads by example and has endless stories from the music industry and life brings insight to his lessons. Todd Brassard, the program’s co-founder, is the other creative mind and industrious driver of the Rock Camp concept. Todd is an electrical engineer by education and a computer programmer and operations manager by trade. Todd has also performed in cover bands since his early high school days and knows all too well the benefits of young people having music as an outlet, regardless of their carrier. In addition to being an instructor when Rock Camp is in session, Todd manages many of the financial, administrative, and promotional aspects of the program. Kenny Stahl, joining rock camp in 2010, quickly became the guy that makes it happen. Kenny is a Musician, Songwriter, Audio Engineer, Producer, Time Traveler, and Stage Manager. Kenny performs with multiple music groups including Stereo Tiger, Girls Who Care, DJ Puuri and Phillip Horny. When performing Kenny Stage Manages The Alan Parsons Live Project as well as teaches Audio Engineering as part of Alan’s Masterclass series. At camp Kenny wears many hats including instructor, administrator, technical director, and the dude with the answers. In the spring of 2009, PJ Olsson was asked to headline the Houghton Spring Art and Music Festival in his hometown of Houghton, MI. PJ agreed, but with a twist. His band would be made up entirely of kids, ages 15 and under, from the local community. Calling his plan a “Rock Camp”, PJ quickly rounded up 18 young musicians and worked with them for three hours a day for the three weeks leading up to the event. The outcome of the project was nothing short of amazing. The positive impact of the experience on the kids and on their dreams for the future was immeasurable. PJ’s Rock Camp and the talented young musicians made the front pages of the local newspapers, featured on NBC affiliate TV6, promoted on multiple local radio stations, and the talk on Facebook for weeks to follow the outdoor event. The kids also started in their own video blog on http://www.pjsrockcamp.com. 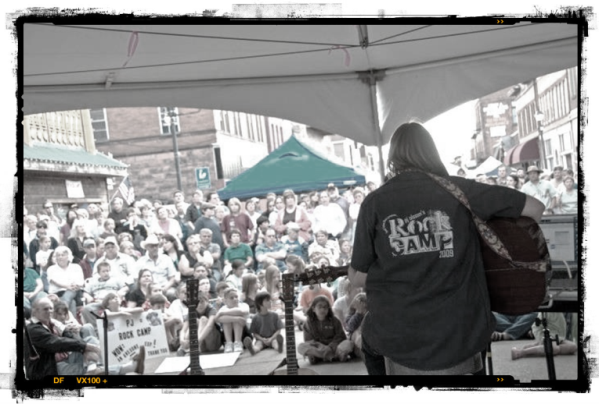 In 2010, PJ and Toddre-conceptualized the Rock Camp to feature the talents of individual campers by organizing the kids into bands based on their musical interests and performance levels. The program found a new home at the Rozsa Center for the Performing Arts (on the campus of Michigan Tech), due in large part to the efforts of the 1,100-seat theater’s Executive Director, Suzanna Brent. 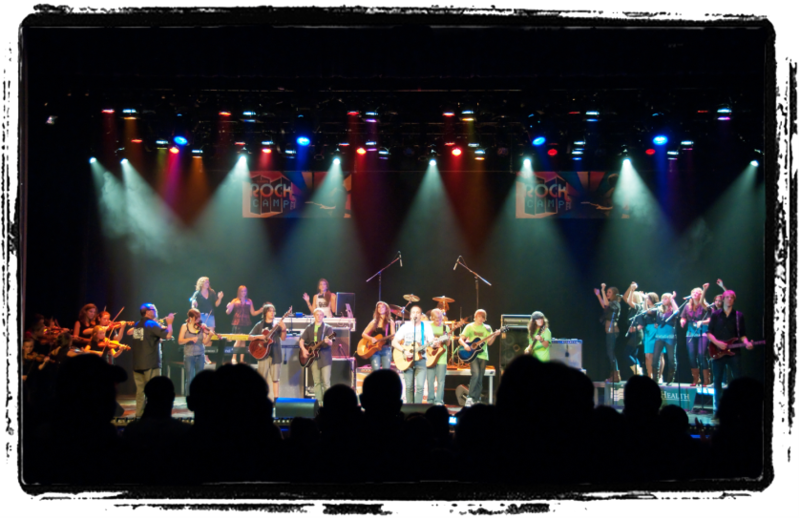 The 2010 Rock Camp final concert made history. Everyone in the audience (more than 600 souls) expected a kids recital, what they experienced instead a full-blown rock concert, an epic journey through many genres of music from hard rock to folk music, country to techno. The campers inspired performances delighted and brought tears to eyes. The kids exceeded everyone’s expectations. Rock camp had made its point; kids in a small community given the right opportunities could accomplish amazing things. PJ Olsson’s Rock Camp had a bright future. A high caliber music program for kids, Rock Camp requires a large amount of human, equipment, facility and promotional resources. Adequate funding solves many problems allowing Rock Camp to bring in professional musicians, purchase equipment and supplies, occupy an amazing facility for several weeks, promote and document the program and final show, and provide financial aid to kids who really need it. 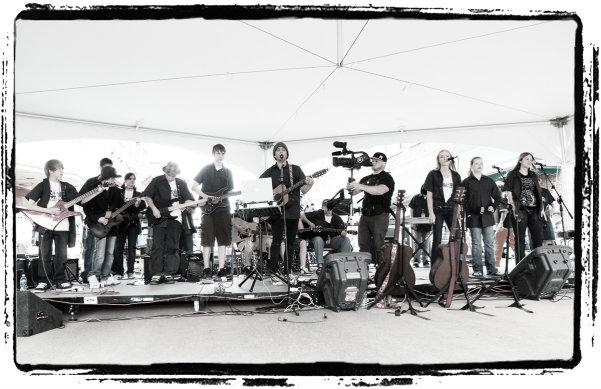 Rock Camp generates revenue from ticket sales, merchandising, fundraising, and registration fees. Each year program directors pour energy time and energy into raising the necessary funds that make Rock Camp possible; time that would be better spent working with the kids. Rock Camp is always looking for those people and organizations who believe these types of programs are important in a community and are willing to provide financial support. I am so stoked about RC2014!! So, I think you should consider the Parnell Williams song “Happy” for your opening number this year. Fun song, nice vocals, good base and all rockers can participate. Just saying.